Reading the latest statements on Iran’s nuclear programme is a bit like being Bill Murray’s character in the film “Groundhog Day”. First supposedly “active WMD programmes” and a potential “mushroom cloud over New York” coming from Iraq, then Bush claiming the same on Iran, now Obama on Iran. Of course everything is completely different this time; at least in that q and n are different letters of the alphabet. Dozens of times before the US and Israeli governments have claimed they have solid evidence proving Iran has an active nuclear programme, just as they did with Iraq’s “active” WMD programmes. Their claims have been proven wrong over and over again. The US and Israeli governments and intelligence agencies have been claiming that Iran was about to produce a nuclear weapon within years, months or days since the early 1990s. In 1992 then CIA officer Robert Gates (now US Defence Secretary) said Iran could have nuclear weapons in “three, four or five years”. Five years later it hadn’t. In 1995 senior Israeli government officials were reported in the American press saying Iran would have a nuclear weapon within 5 years (1). In 2000, it still hadn’t. 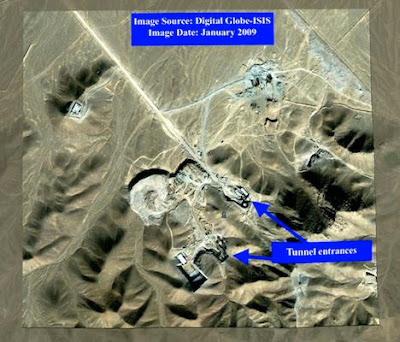 In 2006 the Bush administration claimed Iran could have a nuclear weapon within 16 days (2). Three years later it still doesn’t. To be fair Obama is making more effort to build an international coalition and to give Iran a chance to negotiate. The problem is that by also threatening sanctions and if those don’t end Iran’s supposed nuclear weapons programme, leaving the option of “pre-emptive military strikes” open, it could lead to a disaster even worse than the Iraq war – and create the results it’s meant to prevent : an even more extreme, nuclear armed Iranian government; or terrorists getting hold of nuclear materials in the chaotic aftermath of a “regime change” in which huge numbers of people die (3). The supposedly indisputable evidence this time amounts to some satellite images with some vague images with huge arrows pointing to them from boxes marked “tunnel entrance” (6). If you thought anyone could make something similar and label anything as supposedly being anything using photo-shop, you’d be right. If you thought you’d seen something similar before the Iraq war, you’d be right. 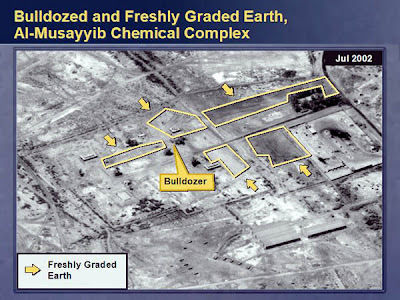 Then US Secretary of State Colin Powell presented ‘conclusive evidence’ of Iraqi chemical weapons plants and “mobile chemical weapons labs” to the UN in February 2002(7). 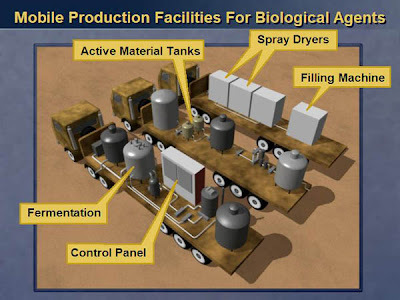 The trouble was that when the world’s foremost chemical and biological weapons experts saw the images and visited Iraq to view the sites they came to the conclusion that the “mobile biological weapons labs” were actually trucks carrying mobile weather balloons used to judge wind speed and direction for artillery fire. This was confirmed later by the CIA (8). One of the experts was Dr. David Kelly, who would later be found dead in a “suicide” that paramedics, friends and doctors said almost certainly wasn’t (9) – (12). Powell’s “Iraqi source” code-named “curve-ball” similarly “committed suicide” in a Libyan prison shortly after Human Rights Watch staff found and interviewed him on how he was tortured into telling CIA operatives that Iraq had WMD programmes (13), (14). Powell would later claim that he was furious to have later found out that the evidence he presented to the UN was false. Yet it wasn’t only UN weapons inspectors who correctly dismissed the claims. Powell he had access to the State Department’s own intelligence reviews on Iraq, which disputed every one of the claims made in the speech well before it was made. Powell also privately told colleagues no WMD would be found in Iraq (15) – (17). So much for conclusive evidence of an Iranian nuclear programme; Iran may or may not have a secret nuclear weapons programme, but don’t look for reliable information on it coming from the US government or its allies. In February 2003 many critics of the Bush administration believed the “evidence” presented to the UN on the grounds that Powell was presenting it. They were wrong to. It would be just as wrong to assume that an administration led by Obama would never present false claims to the world, whether knowingly or in the belief that they’re true. The US and Israeli governments ask why Iran has built secret underground facilities if it’s not to build nuclear weapons. Well it could be to build nuclear weapons – or it could be because the US and Israeli governments have threatened to bomb them so often they’re keeping everything vital underground. As infuriating as it is to be blatantly lied to to justify war, all the debate over whether other countries are developing WMDs misses the point. Like a magician’s sleight of hand it misdirects our attention away from the fact that whether hostile states have WMDs or nuclear weapons or not is irrelevant; because they’d have to commit national suicide to use them – and the past behaviour of the Iranian regime, like Saddam before them, shows they’re not suicidal. True, they may recommend ‘martyrdom’ to other people, but as an organisation they are not prepared to commit suicide themselves. Iran has entirely rational motives to want nuclear weapons, just like Israel. 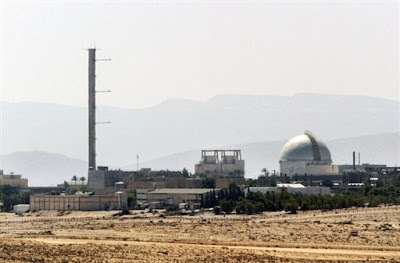 Israel, at war with neighbouring Arab states, developed nuclear weapons in the 1950s and since then has built up an arsenal of between dozens and hundreds of nuclear warheads (18). Iran was invaded by Saddam Hussein’s forces in 1980. Saddam had political support, financial backing and arms sales from most of the world’s governments as he used chemical weapons on Iranians and Iraqi Kurds. That included the US government, who continued funding him even after Halabja. Ahmadinejad fought in the eight year Iran-Iraq War. In 1988, when the USS Vincennes entered Iranian waters and through the negligence of its crew shot down an Iranian civilian airliner, killing over 280 people, the Iranian government and military believed the attack had been deliberate and that the US military was now going to fight alongside Iraq’s. Rather than be defeated and overthrown in a war they couldn’t have won senior Ayatollahs and Revolutionary Guard officers persuaded Khomeini to make peace.They included Khameini, now “Supreme Leader” of Iran and Rafsanjani, now one of the most senior members of Iran’s governing councils. The “Leader” Khameini is Commander in Chief of the Iranian military; not President Ahmadinjead. If Iran had nuclear weapons Khameini would control them, not Ahmadinejad. Yet we’re meant to believe that the same Ayatollahs and Revolutionary Guard commanders who persuaded Khomeini to make peace rather than be overthrown in 1988 would gladly all be destroyed by a nuclear counter-strike from Israel’s allies which would destroy the Islamic Republic they fought for just in order to destroy Israel (19)– (30). p align="justify">We are told to listen to what they say, by a mixture of misquoting the speeches calling for the overthrow of the Israeli government as calls to “wipe Israel off the map”. The actual translation of Ahmadinejad’s supposed “wipe Israel off the map” speeches was a quote from Khomeini’s annual ritual Qod’s Day address. What he actually said was that he hoped the “illegal regime which rules over Quods [in Jerusalem] will be erased from the pages of history.” It was a quote from Khomeini, who said the same annually since the 1979 revolution. In other words for decades the Iranian government have called for “regime change” in Israel just as the Israeli and US governments have threatened and called for “regime change” in Iran repeatedly. One is reported as warmongering and threatening behaviour and provocative, while the other is supposedly entirely legitimate Only when the Bush administration and the Israeli government wanted to carry out “regime change” in Iran was a Qods day address brought up and misquoted as if it was something new and dangerous. (31) – (32). In a subsequent interview with a French TV channel Ahmadinejad clarified that he meant he hoped Israel would collapse the way the Soviet Union collapsed – by the will of all its people – Christian, Jewish and Muslim and suggested a referendum as one possible mechanism (33). It’s worth looking at the context of this speech though. The Israeli government – most of all Prime Minister Ariel Sharon, was vocally trying to persuade the US to attack Iran instead of or as well as Iraq and making threats of Israeli airstrikes on Iran. Iranians, seeing Palestinian civilians and terrorists alike blown to pieces in Sharon’s opportunistic offensive following September 11th, had the message “you’re next”, soon to be reinforced by Bush’s February 2002 “Axis of Evil” speech. In that context Rafsanjani’s speech can be seen as a speech aiming to frighten and deter the US and Israel from attacking Iran – a reaction to their threats to attack Iran; as well as an expression of Iranian anger at the indiscriminate killing of Palestinians, both combatants and civilians. Since the speech was a ‘Qods Day’ speech, on which Khomeini annually condemned the Israeli government for its backing for the Shah’s dictatorship and its oppression of Palestinians, Rafsanjani was reflecting the public mood in Iran, one of anger and fear towards Israel and the US. For many Iranians it is the Israeli and US governments and militaries who are the “terrorists” murdering “us” (Muslims in occupied Palestine, Afghanistan and Iraq). When they see civilians including children killed by US or Israeli airstrikes they are as outraged, angry and afraid as Americans were when they saw people killed on September 11th. The message Rafsanjani was sending was a similar one to that sent out by the US and Israeli governments to Al Qa’ida, Iraq and Iran – if you “terrorists” keep murdering “us” then we will destroy you (35)– (37). Both sides threats were completely counter-productive, putting them each in more danger of attack by the other as it made them feel threatened. If anyone doubts that more than half the Palestinians killed by Israeli forces are civilians they can consult any independent human rights group, such as Amnesty International or the Israeli B’T Selem. Amnesty found that around half the dead in Israeli offensives in the first half of 2008 were civilians, with 70 of the 450 killed being children(38) . B’T Selem’s investigation of Operation Cast Lead in Gaza from December 2008 to January 2009 found that 773 of the 1,387 Palestinians killed by Israeli forces were civilians, with another 248 being police officers killed in Israeli air strikes on police stations. Only 330 were definitely combatants, while for 36 it was uncertain. Palestinian groups meanwhile killed 3 civilians and one Israeli soldier in rocket attacks and 5 soldiers in Gaza. So Israeli forces killed over 100 Palestinians for every Israeli killed and of the Palestinians killed over half were unequivocally unarmed civilians, with about another quarter being police. Almost a quarter of the Palestinians killed – 320 – were children (39). At the same time as being told we should believe Iranian threats against Israel (and badly misquoting them in many cases to change the meaning of the words) we’re told not to listen to what the Iranian government say when they say (as Ahmadinejad and Khameini have many times) that they are not developing nuclear weapons, that nuclear weapons are immoral and un-Islamic. Khameini, like Khomeini before him, has issued fatwas against the production, stockpiling or use of nuclear weapons. Yet it may well be that the Iranian regime, like Saddams, is actually telling the truth. Iraq had no WMDs, Iran may have no nuclear weapons programme.In the 1970s the Shah’s regime had a nuclear weapons programme. If the Islamic Republic’s government really wanted nuclear weapons surely they would have them 34 years later? They don’t. Ahmaedinejad has even said repeatedly that Iran does not want nuclear weapons. For instance in September 2009 he said that “Nuclear arms, we believe they belong to the past and the past generation...We do not see any need for such weapons," This was bizarrely reported by much of the media under headlines such as ‘Ahmadinejad says he won't rule out an Iran nuclear bomb’ (40) – (44). There is of course the real possibility that the constant threats of attack against Iran from the US and Israel from the mid-1990s on could have made it’s government decide to get the technology so it can rapidly construct a weapon as a deterrent if an attack seems imminent. So if most Israelis aren’t worried, why the hype? The constant threats of military action against Iran by the US and Israel over the last decade and the US occupations of countries on both of Iran’s borders – Afghanistan and Iraq – are certainly enough to make them feel threatened; as are US fleets entering their waters from the 1980s on; US backing for Saddam’s attacks on Iran in the past; US Special Forces entering Iran and aiding Sunni and Arab dissident groups to carry out attacks on Iranian government officials and roadside bombings against the Iranian military. In reality Iranians are considerably more threatened by the US, Israel and their allies than any of us are by them. Every Iranian missile launch, including the recent ones, has been accompanied by a warning – don’t attack us, because we can hit back if you do (48)– (50). Iran will not arm terrorist groups with nuclear weapons for the same reason. National suicide by proxy would still be national suicide. Pakistan has had nuclear weapons for decades under an Islamic fundamentalist ideology in its military from General Zia on; yet not one nuclear weapon was handed over to the Islamic terrorist groups it backs. Iran would be no different. Israel, has built up an arsenal of anywhere from dozens to 200 nuclear warheads from the 1960s on. This is surely a much more serious breach of the (hypocritical) Nuclear Non-Proliferation Treaty than anything Iran has done so far, even if all the allegations are true. An Israeli Arab, Mordechai Vanunu, has been jailed or under house arrest for decades for leaking details of the Israeli nuclear weapons programme, which is well known to governments worldwide.Then Israeli Prime Minister Ehud Olmert let slip for the first time in a TV interview that Israel possesses nuclear weapons and nuclear weapons programmes. IAEA inspectors have never been granted access to any of them. (51) - (53). 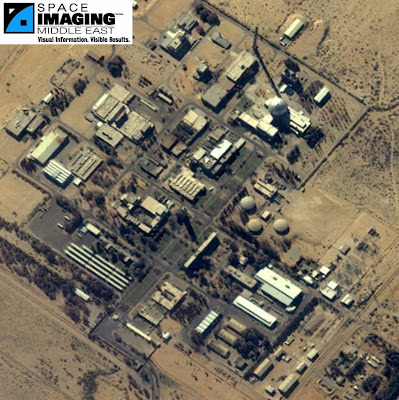 Here are some photos and satellite images you won’t be seeing in the media much – of Israel’s nuclear weapons plant at Dimona in the Negev desert (courtesy of Space Imaging Middle East and AFP respectively). Israel has threatened and carried out attacks on Arab states, occupied Palestinian territory, carried out large scale indiscriminate fire on civilians, torture and gross abuses of human rights against Palestinians as bad as anything the Iranian regime has done to dissidents and minorities in Iran. Yet there has been no condemnation, no threats of sanctions or airstrikes or regime change. Iran’s threats to overthrow the Israeli government are reported as threats of genocide by nuclear weapon. Nuclear armed Israel’s similar threats against Iran are not.Nor is the routine and indiscriminate killing and deliberate starvation of Palestinian civilians by Israeli forces. (21) = Washington Post 22 Mar 1992, ‘Gonzalez's Iraq Expose: Hill Chairman Details U.S. Prewar Courtship, Washington Post archive article here ; full article also reproduced at the Federation of American Scientists' website here ; This gives an account provided by A US Congressman based on information provided to congressional committees by the CIA. The TUC is right to warn against public sector spending cuts (‘Cuts will lead to riots in the streets: TUC Chief’ 14th September =1). Fear-mongering over public debt has reached unsustainable levels. The government have now given in to Conservative party hype over the level of public debt and announced there will be spending cuts. A great deal is made of the fact that Britain’s national debt now almost equals the country’s output. Former US Secretary for Labor and economist Robert Reich points out that after every previous recession public investment in economic and social infrastructure has resulted in resumed economic growth which results in increased government revenues, eliminating the public debt. After the Great Depression and World War II the US federal debt equalled 120% of US GDP. A few years later it was gone. Similarly economic growth under Clinton wiped out the budget deficits run up under Reagan and Bush senior (though the scale of those deficits was so great for so long due to tax-cutting and high military spending that the debt continued to increase and the deficit resumed under Bush junior) (2). Cutting public spending would not revive the economy or boost the private sector. If anything, by making public sector employees unemployed, it would weaken demand, leading to increased unemployment in the private sector too. As more unemployment benefit would have to be paid out and less tax would be collected this would also result in increased public debt. Higher unemployment would also give another boost to extremists and racists like the BNP. Rather than sack more NHS staff when those we have left are already overworked and in some cases made to do jobs they’re neither trained nor paid to do, we could save public money by scrapping the PFIs introduced by Kenneth Clarke when he was Chancellor and expanded by ‘New Labour’ as ‘PPPs’. Some advocates of public spending cuts may also have a personal interest. To give just one example, Kenneth Clarke received at least £5000 for speaking at an event funded by HG Capital, whose website says they are involved in “public-to-private leveraged buy-outs” in areas including “healthcare”. (4), (5), (6). Big public spending cuts would mean more profits for private healthcare firms (though not through PFI this time but more customers as NHS waiting times would rise further). Clarke got another £5000 to £10000 for a speech at an event hosted by Goldman Sachs, an investment bank with a history of owning PFI companies (7), (8). From Kenneth Clarke’s perspective there is probably nothing wrong with this, as many conservatives have an ideological belief in the private sector’s superiority over the public sector and that what is best for private firms is best for everyone. For those that don’t share this ideology though, taking money from firms making money from privatisation, private health care and PFIs while calling for big public sector spending cuts makes making expenses claims for moat cleaning and duck houses look mild by comparison. There are certainly areas where we could cut public spending. Apart from PFIs/PPPs, there are Export Credit Guarantees for arms sales to dictatorships, which frequently result in the taxpayer effectively paying for arms for these regimes. One was Saddam’s after the Gulf War. There are the massive subsidies that go to nuclear power to make it appear cheaper than the alternatives. There are the subsidies to privatised rail firms who keep all the profits from ticket prices that have risen at far above the rate of inflation. However it’s doubtful whether the right wing of the Labour party can be trusted to cut these rather than vital public sector jobs and the Conservative party’s record and current ideology suggests it definitely can’t be. Lockerbie : Doesn’t the truth matter ? The casual dishonesty or ignorance of FBI Director Robert Mueller and much of the media ignores the evidence in the Lockerbie case shows Megrahi’s trial was a sham. The history behind Lockerbie also shows that sending our military abroad is as likely to put us in danger and cost civilian lives as to protect them, whether the Libyan government, the Iranian government, or both, were those seeking revenge. Michael Shields, another man wrongly convicted of murder, has just been released on the orders of British home secretary Jack Straw, because he was innocent of the crime he was accused of. If his release doesn’t lead to outrage, why does Megrahi’s? The Scottish government has so far not gone far enough towards facing the truth that Scottish judges were politically influenced and Scottish courts compromised, though that may be change if they back a public inquiry. The judges' verdict was entirely inconsistent, accepting the testimony of witnesses where it backed the prosecution case, while simultaneously rubbishing the same witnesses as unreliable where their testimony flatly contradicted the prosecution case. The British and American governments meanwhile present the usual propaganda line about sending the military abroad making us safer. In fact the US government’s decision to arm and fund Saddam in the Iran-Iraq war led to the USS Vincennes shooting down an Iranian airliner, killing 298 civilians; and to the Iranian government believing this was a deliberate act. The Lockerbie bombing may well have been a revenge attack resulting from this. Far from making us safer our governments’ foreign policies have cost civilians’ lives abroad and caused terrorist revenge attacks. There are also serious questions about how the bomb got on the plane in the first place. Many commentators, newspapers and TV stations have provided hard-hitting commentary on the Megrahi case. The problem is most of them either don’t know the facts or else have casual contempt for the truth. Gaddafi and Libyan intelligence may or may not have been involved in the Lockerbie bombing, but there is no solid evidence that they were. One rule for foreigners, another for white, English speaking people? Yesterday a convicted attempted murderer was released from prison on the orders of a politician. He was found guilty by a court of trying to beat a Bulgarian man to death with a paving slab. The freed man’s name is Michael Shields and he was released, rightly, on the orders of British Home Secretary Jack Straw, because the evidence showed he was innocent. I’m glad he’s been released. There was no outrage, because despite being convicted, he wasn’t guilty. Yet in Megrahi’s case it’s very different. Almost every news report, with no attempt at unbiased coverage, refers to him as “the Lockerbie bomber” or “convicted mass murderer”, ignoring the fact that his trial was a sham (1). FBI Director Robert Mueller claimed in his letter to Kenny MacAskill that Megrahi had been convicted by a “jury” under “due process” (2). The Observer newspaper meanwhile claimed that “there was enough incriminating testimony by others for a jury to find him guilty” (3). The slight problem here is that there was no jury at Megrahi’s trial. There were three judges, appointed by the Lord Advocate, a political appointee. Are the Director of the FBI and the Editor of the Observer really so poorly informed and briefed that they hadn’t even checked the most basic facts? Or, in Mueller’s case, is he dishonest? British human rights and newspaper columnist lawyer Geoffrey Robertson is one of those claiming that Megrahi was found guilty by a court of judges and so is guilty (4). Robertson also lambasts the lack of “due process” in Megrahi’s trial, while Dominic Lawson says that “Justice was what the Scottish court honoured when sentencing the Libyan to imprisonment for life”(5). The core argument is that Megrahi was convicted by a court and so he’s been proven guilty. Would any of these people think it was fair if they were on trial and there was no jury? Would they be happy if one of the prosecution witnesses was shown photos and articles identifying them as being guilty – and that witness then identified them – and was subsequently paid $2 million? That’s exactly what happened in the case of Tony Gauci, one of the key witnesses at Megrahi’s trial, who was paid $2 million by the US government after the trial (6), (7), (8). The Lockerbie verdict, which is available online, is full of statements by the judges that show that they accepted any evidence from any witness that supported the prosecution’s case, while dismissing testimony from the same witnesses – e.g Edwin Bollier – where it contradicted the prosecution case. It’s obvious from this that the judges were biased towards the prosecution and against the defence – and were not impartial in their judgement. It’s not impossible that witnesses were being threatened and or offered bribes by both sides – the CIA and Libyan intelligence – but to rubbish testimony from witnesses like Tony Gauci and Edwin Bollier as belonging “in the realm of fiction” where it contradicts the prosecution case and then taking it as gospel truth where it supports the prosecution case is not credible (9). The verdict delivered by the judges at Megrahi’s trial included a self-contradictory reference to Gauci as a witness who tried to give “the false impression” that “his continued association with the American authorities was largely motivated by financial considerations” and that “information provided by a paid informer is always open to the criticism that it may be invented...and in our view this is a case where such criticism is more than usually justified”. (Of course there may well be reason to think Gauci’s boasting about being paid for his testimony wasn’t false) (10). Hans Koechler, a UN observer at the trial, UN Observer Hans Koechler said the verdict was inconsistent due to British and American government political pressure on the judges (11), (12). Would Mueller or Lawson be happy if evidence in their own trial was tampered with and expert witnesses’ opinions ignored? Edwin Bollier, who was brought in as a witness on the bomb timer fragment produced by the prosecution, says the fragment was tampered with between him first being shown it – and saying it didn’t match the type his firm sold to Libyan intelligence – and it being presented in court. He also says his views were ignored in court (13). Scottish Law Professor Robert Black, who helped establish the trial, said that the prosecution case against Megrahi was so weak that “if the evidence had come out in front of a Scottish jury of 15 there is absolutely no way he would have been convicted” (14). UN Observer Hans Koechler also said that the denial of Megrahi’s appeal for a re-trial in 2002 was “a spectacular miscarriage of justice” (15), (16). The Scottish Criminal Cases Review Commission in 2007 found that there were many serious problems with the original trial and recommended that Megrahi be granted an appeal. It’s full report has never been published but a press release summarising it has (17). Yet those who say Megrahi was guilty simply repeat that a court found him guilty (along with the inaccurate claims about juries and “due process”). Everything else is dismissed. So is any trial, however unfair, justice now? If so then the victim’s of Stalin’s show trials would have been guilty; after all, the judges said they were. If Megrahi’s trial is what passes for justice in Scotland then we should weep for shame. Those shouting most loudly about their “outrage” and “shame” at Megrahi’s release are the ones who should be ashamed of defending a show trial that jailed a man who may well be innocent for a decade while the guilty, whoever they may be, still go free. Gaddafi and Libyan intelligence were certainly involved in many terrorist acts, including, probably, the bombing of a French TWA flights and providing Semtex used by the IRA (24). I don’t know what kind of a man Abdul Ali Basset Al Megrahi is. He was a member of Libyan intelligence under Megrahi. Libyan intelligence are not saints. They have been involved in torture, murder, assassination and terrorism. There is no evidence though that Megrahi or Gaddafi were involved in the Lockerbie bombing and in a democracy under the rule of law we don’t jail people without evidence they committed a crime. I have nothing against jailing any member of Libyan intelligence involved in terrorist acts. If they were involved they should be tried for those crimes – and Gaddafi too if he ordered those attacks. I am not accusing the judges in the Lockerbie case of corruption either. They are more likely just to be biased political appointees and too easily influenced by the claims of the British and American governments and their intelligence agencies, which, despite being democratically elected, are no more honest or neutral than Gadaffi’s government. Conspiracy theories ; and do foreign wars protect civilians from terrorism or get them killed by it? Dominic Lawson rubbishes “the conspiracy theory” that Iran, not Libya, was behind the Lockerbie bombing, claiming that to believe it we would have to believe the US government wanted to protect the Iranian government, despite the hostility between the two. While claiming Iraqi attacks on oil tankers were legitimate (Reagan even saying that “we have always recognised that in a time of war the enemy’s commerce and trade is a fair target”) the US decided it would protect oil tankers from Iranian attacks. In 1988 it decided to provide US Navy escorts to oil tankers in the Gulf (with the exception of Iranian ones), allowing them to re-flag as American. The Vincennes was one of the escorts, but entered Iranian waters and began a fight with Iranian navy vessels. During this fight the Vincennes’ crew did not use their identification systems properly, resulting in them shooting down an Iranian passenger plane, Iran Air Flight 655, killing all 298 people aboard (32), (33). Given American support for Saddam throughout the war the Iranian government did not believe this was an accident. They thought it was a deliberate act and a threat that US forces were joining the war on the Iraqi side. Khomeini sued for peace with Iraq (34) – (36). The Vincennes’ crew were given routine combat medals at the end of their tour and the US government refused to apologise for the deaths, though it did say it “regretted” them and paid compensation. Khomeini vowed that “the skies will rain blood” and offered a large amount of money to anyone who could bring down a plane full of Americans (37). The initial investigations of Lockerbie found that the PFLP-GC, a Palestinian terrorist group backed by the Syrian government, was contracted by them on behalf of the Iranian government to place a bomb on Pan Am Flight 103 (38) – (43). The US government had deployed it’s military to defend Saddam. This led to almost 300 civilians being killed on Iran Air Flight 655, which resulted in the revenge attack which killed almost as many on Pam Am 103. This would not reflect well on them if it was reported internationally during a court case. What’s more in the run up to the 1990 Gulf War the US wanted to isolate Saddam so that he couldn’t pose as defending the Arab world against them. It wanted Syria as part of the Coalition against Saddam and ideally Iranian neutrality and use of Iranian airspace. President Assad of Syria readily agreed (44). So President Bush (senior) would announce that Syria “took a bum rap” on Lockerbie and Gaddafi and Libyan intelligence were responsible. So the US government was not protecting the Iranian government, but itself and it’s military. Simultaneously it was showing that those governments who complied with US demands would be rewarded, just as those who refused to would be punished. This does not mean that Libyan intelligence couldn’t also have been involved. Libyan intelligence co-operated with terrorist groups worldwide and was accused of bombing a disco in Germany in 1986, killing American soldiers. The US retaliation involved airstrikes on Tripoli in which it a military barracks, a school, houses and the French embassy, killing around 100 people, including Gaddafi’s adopted 1 year old daughter. The planes had been allowed to refuel in the UK, so Gaddafi certainly had a motive for revenge on both the American and British governments. No solid evidence of Libyan involvement in Lockerbie has emerged so far though (45), (46). US intelligence agencies may also have had motives to obscure the truth about Lockerbie. In the 1980s the Iran-Contra scandal included revelations that Colonel Oliver North had been acting on behalf of the US Presidency to arm the Contra rebels in Nicaragua. As congress had passed a law banning any US funding for the contras money had to be found to pay for the arms. The same planes taking arms to the contras from the US brought drugs from central American countries to the US. Drug Enforcement Agency officers were informed by the CIA that they could not search these flights nor investigate them for reasons of national security. North was also in command of a US Defence Intelligence Agency operation relating to drug smuggling between Lebanon and Europe. Suitcases containing drugs were exempted from security checks at airports. If a bomb could be placed in one of the drugs shipments it wouldn’t be checked by airport security. Who placed the bomb remains unknown. Some say the PFLP-GC on behalf of Iran. Others believe that North and his associates had been rumbled by CIA officers who were going to reveal CIA involvement in drug smuggling from Lebanon – and that North had a bomb placed on the plane to silence them forever (47) – (53). I don’t know which, if any, of these theories, is true. However as Professor Robert Black wrote “for the judges to return verdicts of guilty they would require (i) to accept every incriminating inference that the Crown invited them to draw from evidence that was on the face of it neutral and capable of supporting quite innocent inferences, (ii) to be satisfied beyond reasonable doubt that the Maltese shopkeeper, Tony Gauci, positively identified Megrahi as the person who bought from his shop in Sliema the clothes and umbrella contained in the suitcase that held the bomb and (iii) to accept that the date of purchase of these items was proved to be December 7, 1988 (as distinct from November 23, 1988 when Megrahi was not present on Malta). In other words the prosecution case at Megrahi’s trial was nothing but a conspiracy theory with no real evidence to back it up, requiring bribing witnesses and tampering with evidence to get even a politically appointed court with no jury to accept it. What is certain is that Megrahi’s trial was unfair and manipulated by the US and British government and intelligence agencies. Whether they did this because they believed Megrahi and Gaddafi were guilty and didn’t have the evidence for a conviction, or because they wanted to avoid any link between Iran Air Flight 655 and Pam Am 103, or because they were covering up for official involvement in drug trafficking which allowed the bombers to get the device on the plane, I don’t know. What seems certain is that Scottish courts were politically manipulated and the truth about the bombing of Pan Am Flight 103 has been denied to the families of those who died over Lockerbie – and that military action abroad often kills far more civilians directly – and indirectly by inciting terrorist revenge attacks – than it saves. That holds whether you believe Iran carried out Lockerbie without Libyan involvement, or that Libya was involved in the Lockerbie bombing. If Libya was involved revenge for the one hundred people, many civilians and children, killed in the US air strikes on Tripoli on 15th April 1986, would have been a motive (55). Revenge is not justice, it just kills innocent people, but there is no doubt that military action abroad routinely kills civilians and creates terrorist revenge attacks that otherwise would not have been carried out. It does not protect us. As in the cases of the July 7th bombings in London (linked to the Iraq war) and the Lockerbie bombing (linked to Iran Air Flight 655 and/or the bombing of Tripoli) it puts us in more danger. (27) = Washington Post 22 Mar 1992, ‘Gonzalez's Iraq Expose: Hill Chairman Details U.S. Prewar Courtship, Washington Post archive article here ; full article also reproduced at the Federation of American Scientists' website here ; This gives an account provided by A US Congressman based on information provided to congressional committees by the CIA.